Week 6 how you doin. Last week we met up with Jeff Wells – a second cousin from Clearwater, Florida, but also Cleveland. Jeff was up doing his summer thing which is teaching kids how to sail boats up at Chewonki. Jeff represents a huge side of our family we have never met – the Wells side, from which our farm gets its name. 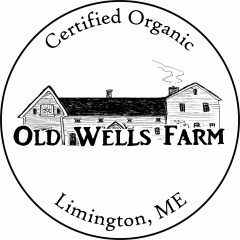 Well, to be clear, our farm is named after the Reverend Howard Wells, who was my great grandfather and who was so prominent in Limington that old timers around here still call our house “The old Wells place”. Naming a farm is no easy task. It is something you have to live with for a while, something that becomes the flag of your business – so there is a lot of pressure to do it right. We undertook the naming process with the care one would reserve for naming a child or a band – no ordinary name would do. We started by compiling a list of stuff we either liked, thought was important, or felt drawn to – that list was something like this: nature, vegetables, dragons, swords, music, dancing, friends, mystical spellcasting, food, Volvos, old house, dogs, Limington, peace, freedom, rainbows, equality, soil, work – and on and on. The first name of the farm was Wild Folk Farm, but we soon found out someone else in Maine had already named their farm that – we understood, it was a sweet name. The next ideas were all pretty good: Willy Nilly Farm, Faxter Barley Farm, Steller Watters Farm, Dragons Farm, The Limington Farm and so on. But Old Wells Farm stuck with us because it connects us to our past and serves as a bridge to the future; a bridge to the new old Wells place. Also there are a ton of old wells on the property – stone lined deals that are covered in old Volvo hoods. Thanks again for being part of our farm. This week’s share is the Maine event – highlighted by bluebs and potats. Hope you like it.